From 51 to 71 € the night I book ! 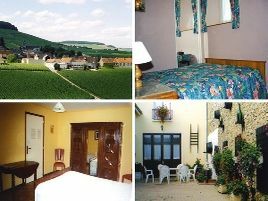 Les Botterets bed and breakfast is situated a few miles from Epernay and Reims, in the heart of the Champagne vineyards. With its typical local architecture, the house lies within the heart of the village, renowned for its flower decorations. Lovely flower-decked courtyard. Traditionally decorated rooms with family furniture and ornaments. Easygoing and friendly welcome from this family of winegrowers..
- cette adresse est idéale pour découvrir le vignoble du Champagne. - golf de Dormans à 18 km. 5 rooms with shower and WC. 51 euros (1 pers. ), 56 euros (2 pers. ), 71 euros (3 pers.). The closest station is Epernay, located at 10 km. The closest airport is Vatry, to 20 km.